Late Palaeozoic intrusives are largely confined to the Southern Uplands-Down-Longford Terrane in Counties Down and Armagh . By far the largest, the Newry Igneous Complex, consists of late orogenic I-Type (Caledonian) granite rocks. Their intrusion at, or just before, 400Ma post-dated both the closure of the Iapetus Ocean and continental collision in the end Silurian-early Devonian period, but coincided with the onset of sinistral transpression in the Iapetus suture zone . The complex lies between Slieve Croob and Forkill and was emplaced in Silurian greywacke and mudstone (P947810). In addition to three overlapping granodiorite plutons there is an earlier intrusion of intermediate and ultramafic rocks at its northeastern end. 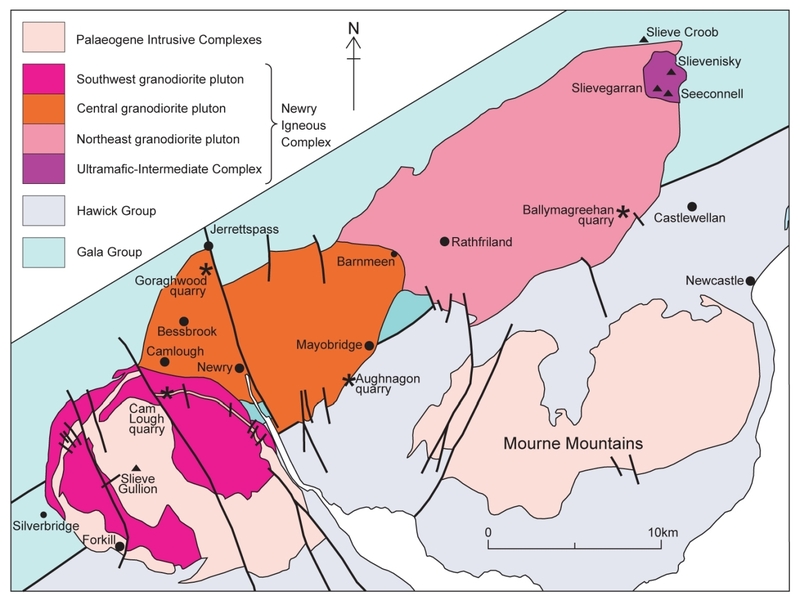 The intrusion of the Newry Igneous Complex was associated with the injection of dykes and sills of largely lamprophyric composition in two separate episodes. These minor intrusions are genetically related to the northeastern sector of the complex and are thus concentrated in Co. Down. To a much lesser extent lamprophyric intrusions are also found in the Midland Valley and Central Highlands (Grampian) terranes. ↑ Geological Survey of Northern Ireland 1997. Northern Ireland. Solid Geology (second edition). 1:250 000. (Keyworth, Nottingham: British Geological Survey). ↑ Murphy, F C. 1987. Late Caledonian granitoids and timing of deformation in the Iapetus suture zone of eastern Ireland. Geological Magazine, 124, 135–42. This page was last modified on 25 September 2017, at 13:41.